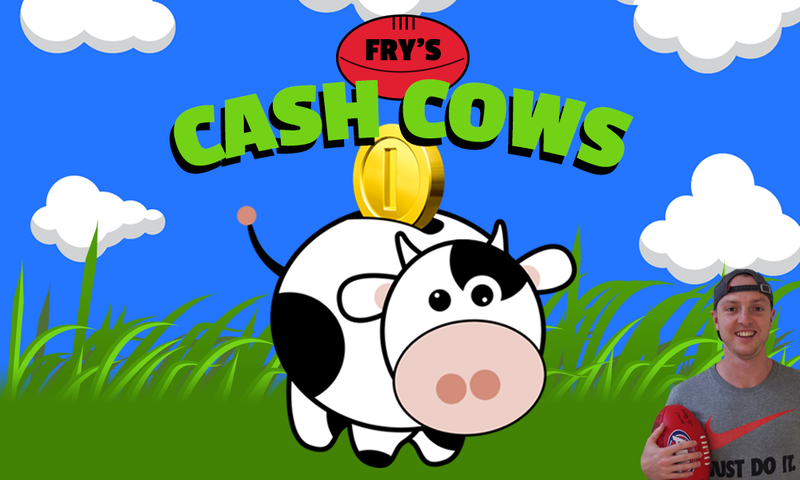 With a new AFL Fantasy season only a few sleeps away Fry gives us a look at the must have rookies/cash cows for 2019! Only a few days separate us from 23 stressful weekends as coaches around the globe gear up for yet another season of AFL Fantasy. To drive away in a shiny Toyota Corolla a lot of things have to go right throughout the season, one of which is your cash cow selections. This season is as testing as any in the past with rookie picks fluctuating in and out of our starting sides all preseason. The good news is an influx of mature agers should provide us with downgrade options through the duration of the season, but picking the right guys to have in your starting side is always a tough ask. After weeks and months of uncertainty, I’ve done some number crunching to rank the top 22 cash cows options covering each line to start 2019. If you missed out on my pre-JLT cash cow watchlist be sure to check it out here. Ironically, right now Xavier Duursma isn’t in my side with the second and third ranked defensive rooks getting the nod in the Large Fry’s & Coke. If Duursma is named like well all expect to start the season then my hand might be forced, following his awesome game against North Melbourne in JLT2. Scoring a near ton from just two-thirds of game-time a lot of coaches (22% to be exact) have taken the punt on the Port young gun. The jury is still out on the Power’s game plan, but if they really have changed their style and plan to adopt a more attacking brand of footy then Duursma’s pace and skill will be a nice addition to our backlines. Job security is arguably the most important thing we covet from our rookies and Sam Collins has the best JS out of the defensive cash cows. After being delisted by the Dockers, Collins had an unreal year at VFL level in 2018 breaking records with his intercept marking prowess in defense. Despite having just seven marks through two JLT contests, Collins will be a feature of the Suns’ back six for the entire season making him hard to pass up for your starting side. His 37 points against the Swans is a concern, but with Gold Coast set to struggle in 2019, there will be a lot of the footy around Collins, giving him every opportunity to take 5-6 marks a game. He might not have the highest ceiling of the fantasy rooks in his line, but after averaging 11 marks and 14 kicks from 18 games at Werribee we can expect to see his +6 play translate to the AFL level. Roaming across the half-back line and playing with poise beyond his years during the JLT has seen Jordan Clark vault into fantasy calculations. A clean ball user hailing from WA, Clark was the 15th pick in last year draft and early on you can see why Geelong wanted to snap him up. There are some small concerns over his job security, with injured veteran defender Zach Tuohy expected to push Clark out of the side when he returns in about 2-3 weeks. I’m backing Clark to do a good enough job in the first few weeks to hold his spot in the side and we have already seen flashes of what he’s capable of during the preseason. Two par JLT scores weren’t exactly what we wanted from Marty Hore, but his numbers don’t really highlight how good a player he is. An elite user by foot, Hore averaged 21 touches playing for Collingwood’s VFL side a year ago and could become Melbourne’s kick-in specialist after taking on some of the duties this preseason. The big question is whether he will be named to start the season for the Dees and if so, can he hold down a regular place in Melbourne’s defense. Jake Lever will miss at least another 3-4 months and Kade Kolodjashnij is injured for a change so he won’t feature in the first few rounds of the season, helping Hore’s job security some. Hopefully, impressive outings early will keep in Hore in the Demons lineup, and in our sides for a good chunk of the year. Scrimshaw is probably getting a bit of a raw deal being slotted in as the 5th best defensive cash cow. Foot problems, a broken cheekbone, concussions and hip surgery have held him to just four AFL games in his career which led to the Gold Coast Suns trading him away last summer. Landing at Hawthorn could help the former top-10 pick revive his career and early signs this preseason are promising. He didn’t dominate the box score in the JLT, but Scrimshaw erupted against Richmond with a 52 point first quarter, highlighting what he’s capable of. He’s not in my side right now and the extra $30K he costs over basement types may make him hard for coaches to squeeze in. If he’s given regular games and can stay healthy though, Scrimshaw could be in for a stellar season. I’m cheating slightly by putting Chris Burgess in my defense section, but the versatile big man is a good option in either defense or forward. Key position players are never going to be the best fantasy scorers and we saw how ugly some of their scores can be when he took on Sydney the other weekend. Rory Thompson rupturing his ACL last week could see Burgess swung into defense more often this season, but similar to Sam Collins, we should see Burgess hold his spot in the Suns side for the majority of the year. At $170K he will at least make us some money and looms as an emergency option good for 40-50 if something goes pear-shaped. Young Hawk Harrison Jones (Hawks, $170K) has been sitting on my bench for most of the preseason and even after playing two JLT games his spot in the Hawthorn side for Round 1 isn’t set in stone. He could be a bench option if he’s named along with Francis Watson (Eagles, $170K) who starred against Geelong with 95 points and 10 tackles in JLT 1. Watson’s place in the Eagles 22 is sketchy at best and I can’t see him getting regular games throughout 2019. Costing a few more dollars Isaac Quaynor (Pies, $246K) is another one who may have to fight for his place in the side and doesn’t quite crack the top-6 based on that uncertainty. Sam Walsh is the second most selected player in the game behind Patrick Dangerfield right now. I pushed to write about Walsh in the Deck of DT this preseason because I’m all in on this kid. I genuinely think he can nudge his average over 80 and perhaps even flirt with 90, but it would be unfair to expect that much of him in his first AFL season. I’m probably overhyping Walsh a touch, but after an impressive pre-draft season at TAC Cup and U/18 level, we can all expect him to be one of the more reliable rookies for this season. With a breakeven of just 37 though, averaging double that will put him in rare cash cow territory. Lock him in, don’t even think twice. Next. A bit unlucky to not get an AFL berth last season Charlie Constable appears set to be an integral part of our cash cow structure this season. The 19-year old has a season of VFL footy under his belt now, where he averaged 24 touches a game and averaged 86 points through his 15 matches. Constable should suit up for Friday night’s match against Collingwood, but there are some question marks over how he can fit in Geelong’s loaded midfield for the entire season. Gary Ablett spending more time up forward should open up some midfield minutes for Constable though and if he’s picked to start the season it’s a pretty good indication of where he sits in Geelong’s plans this season. A healthy Scott Selwood is probably the only other concern of pushing him out of the side, but I have high hopes for Constable. This kid can seriously play. Taken 12th overall by Port Adelaide in the past draft period, Butters and a handful of his teammates are expected to be handed their AFL debuts to start the season by Ken Hinkley. I initially made the mistake of leaving him out of my pre-JLT watchlist and 93 points against the Crows in his first outing in a Port jumper was enough to bring him into a lot of coaches’ thinking. He comes at a cost, but Butters will likely remain a cog in the Port Adelaide lineup for a good portion of the season. Ollie Wines’ return to the side might push Butters out, but I think he’s higher up on the pecking order than some of his fellow cash cow teammates. Former Geelong Cats VFL skipper Tom Atkins should be higher up on the list given his footy talents. Can tackle his way to a big score and once upon a time had 23 hugs in a single game! Much like Constable his place in the Geelong midfield is cloudy and could become a problem throughout the season. That being said, the big-bodied mid will likely help to ease the load on aging players like Joel Selwood and Patrick Dangerfield. If he’s named to start Round 1, which is very likely, take a punt on him with one of your bench spots (or even on your field if you’re feeling lucky) and don’t look back! Father-son selection Bailey Scott provides us with yet another basement priced player who should be in for a good first season. He didn’t look out of place during the preseason for North averaging 73 fantasy points and 20 touches from two contests. North Melbourne is a tough team to peg for 2019, but my hunch is they’ll slide a bit from their 9th placed finish last season, which could lead to them getting more games into their younger players. Scott may not break into the Roos’ line-up to start 2019, but even if he doesn’t he’ll be someone to consider when he eventually gets a berth. After joining the Blues via the SSP (supplemental selection player) rule, Michael Gibbons has quickly become a relevant fantasy name. The dual J.J Liston Medal winner (the VFL equivalent of the Brownlow) will likely hold a spot in the Blues’ best 22 for the season, however, his role is why he’s bumped a bit further down the pecking order. Gibbons spent most of his time as a small forward for Carlton during the JLT and if he plays that role throughout the year it’s tough to see him producing huge scores that were associated with his VFL play. It’s not all bad news though, if Gibbons does play most of his minutes up forward he’ll be a great chance to get DPP status in Round 6, giving us a handy link between lines. We’re bound to see him run through the midfield at some point though and at $170K he’s currently in 22% of teams most likely residing in a midfield bench spot. One of the only players on the list with previous AFL experience Luke Davies-Uniacke failed to fire last year and as a result, comes at a discount in 2019. After posting just two scores over 35 from his seven AFL games to date, LDU showed promising signs during the JLT that he can be bigger and better after a year in the AFL system. His 81 points against St Kilda looks good on paper, but he needed 27 touches to amass his points. Two confident performances under his belt have nearly 5% of coaches taking a chance on Davies-Uniacke, but given the value for money available in the midfield this season he’s not in my thinking. Hopefully, he proves me wrong and becomes someone we can rely on to generate some cash. If we had confirmation that Will Hayes was going to be in the Bulldogs side with regularity this season then he’d be much higher up this list. For the past two seasons, Hayes has been putting up numbers in the VFL with the mature-ager finally given a chance by the Dogs, who opted to select him with the last pick in the Draft. It’s no secret that the Bulldogs’ strength lies in their midfield making it tough to see Hayes playing 10-15 games unless injuries hit the club. We’ll be watching to see if he’s named in Round 1 to get an idea of where he lies in the Dogs’ depth chart. Top dollar draftees like Giants pair Jye Caldwell (Giants, $250K) & Jackson Hately (Giants, $244K) and No. 7 pick Bailey Smith (Dogs, $258K) featured in both of the JLT games but didn’t really show enough vie for the top spots on the list. Given their inflated price and uncertainty around job security, you can probably pass on them to start the year and make a move for them if they wow out of the gates, even though it’s unlikely. One of the losers from the JLT Series was Brett Bewley (Dockers, $170K) who was in plenty of sides before preseason footy action. Bewley did manage to score 57 points from just half a game against Collingwood, but his spot in the side is questionable after being originally left out the Eagles clash only to come in as a late inclusion. A similar thing can be said for Nick Hind (Saints, $170K), who played both JLT games but only managed a 31 and 27. Granted it was from around 55% TOG, but those two took a hit and it’s questionable whether they should be starting in our sides. Another basement priced player in Jack Ross (Tigers, $170K) could be worth keeping an eye however, the Tigers midfield rotation is one of the toughest to break into, meaning he won’t likely see a ton of games in his first season. Going off his big JLT 1 score Zac Clarke was emerging as a legitimate option to start the season with. It’s a risky one no doubt, but without an appearance in the second JLT game, it’s probably unwise to have Clarke in your team to start the year even if he’s named. Tom Bellchambers will spend most of the season as Essendon’s go to ruckmen, so even if Clarke makes the first team of the year he’ll have his fantasy ceiling impacted by Bellchambers’ presence. Joe Daniher’s injury might see Clarke come in for a few games and swing between the ruck and forward line, but it appears unlikely. Archie Smith failed to add any AFL experience to his resume last season after featuring in six games during the 2017 season. You couldn’t even consider starting with Smith on the field, but he may be a bench option who can make you some money. His second JLT contest was cut short after he suffered a throat injury but appears set to play alongside Stefan Martin to commence the year. The extra dollars you have to spend on Smith over a $170K player could be used elsewhere, but he might be a smart play in one of your final bench places. If he’s named to start the year next to Stef then he should at least generate some money that can be used in later rounds. There are three clear choices as the best of the rest in the ruck department. Darcy Fort (Cats, $170K) & Matthew Flynn (Giants, $170K) didn’t dominate but played some minutes over the JLT period. They may get games early in the season and while they won’t set the world on fire they can still do their role and generate extra dollars. Finally, with a high ownership percentage than Max Gawn, Darcy Cameron (Swans, $170K) has been a bench ruck staple for years and should anything happen to Callum Sinclair it’s likely he’ll see more game time. Setterfield getting a fresh start at Carlton could see him finally live up to the hype of being a top-5 pick a few years ago. Injuries ruined his GWS career and now that he’s a Navy Blue over half the competition is taking a chance on the healthy Setterfield. With added midfield flexibility more coaches are opting to play Setterfield up forward, but having a link between the two lines is always handy. He only managed seven games last year at NEAFL level but averaged 25 touches a contest with seven tackles and his ability to win the ball on the inside and outside will see him stay in our sides for most of the year. His injury history might worry some, but if he’s as good as advertised in the preseason 52% of coaches will be rubbing their hands together. After spending a few years on Port Adelaide’s list, Willem Drew is set to be fantasy relevant for the first time this season. His DPP status has some coaches playing him on their field in multiple lines and his second JLT game is a good indication of what we can expect this season. A serious foot injury held him to just one game last year but Drew featured in 20 SANFL games in 2017 and the rangy midfielder adds some size to Port’s on-ball brigade. Time will tell how long he can hang around for with Ollie Wines and Hamish Hartlett set to come back into Port’s side when healthy. If Drew plays his cards right though he can solidify his spot in the team with some good games early. His scores might not show it, but Matthew Parker looks set to be a staple in St Kilda’s side this year. His pressure acts were a big talking point of his preseason games and the mature ager will likely start in the Saints lineup against Gold Coast following his ability to provide pressure inside the Saints attacking half. With slim pickings in the forward line his output won’t likely be incredible, but after not putting a foot wrong all preseason Parker’s job security should see him get a spot in a lot of fantasy teams. Likely to be a bench option or the final on-field spot in your forward line, we can expect a few 40’s from Parker but there’s every chance he can kick a bag and produce some decent scores throughout the season as well. The classy Connor Rozee could feature in both forward and defensive lines throughout the year, yet throughout the JLT we got a good look at the type of player he is. Throughout his pre-draft season, Rozee only averaged 60 fantasy points and 13 disposals as a North Adelaide premiership player and failing to accumulate a lot of possessions doesn’t usually translate to high scores. That being said, Rozee is a special talent who will only get better with time and Port Adelaide seem set to give him every opportunity to succeed from day dot. One of the most expensive cash cows to start the year might not be in everyone’s thinking, but if you’re a Rozee fan I think you can back him in. Fantasy scores aren’t kind to non-ruckmen tall timber, but Jack Lukosius isn’t your generic key forward. His ability to patrol the ground and utilise his great foot skills is only part of the reason why the Suns drafted him so high and they should help him chalk up solid numbers in year one. It’s tough to justify picking Lukosius for your starting team given his hefty price tag and his fantasy ceiling. Playing as the Gold Coast Suns primary source of scoring isn’t going to see Lukosius raking up the touches though, with the footy more likely to spend time in the Suns’ defense. Still, with a long way back to the top, the Suns will prioritise playing their kids and developing them for years in the future and Lukosius will be a valuable player throughout the season, doing his job as a cash cow. With Mark LeCras’ retirement, a spot in the Eagles forward line is up for grabs and Jack Petrucelle has emerged as the favourite to claim the open place. The dangerous forward earned his AFL debut last season and kicked two goals in his second outing against Port Adelaide. However, in his three career games to date, Petruccelle has fantasy scores of 13, 35 and 16 making him only really an option for your bench. If he’s given regular game time though then there’s every chance he can increase his output and offer us a security blanket/ emergency choice in the forward line. His low possession style of play doesn’t make him much more than that though. One of the more popular players that coaches are taking a chance on at this stage is Tigers forward Noah Balta (Tigers, $170K). He turned heads with a 98 in the first weekend of JLT action but will find it tough to hold his spot in a Richmond line-up that boasts Jack Riewoldt, Toby Nankervis, Tom Lynch and potentially Ivan Soldo. You would think Balta can take Soldo’s place and play a role as the backup ruck as well. Jarrod Brandor (Eagles, $170K) & Gyran Miers (Cats, $170K) are two other names to remember with the duo set to become downgrade options during the season. Brandor particularly interests me and the versatile big man may even get a chance to start the season West Coast’s lineup. Before I sign off here are some quick parting thoughts with the season almost within grasp. When it comes to selecting your cash cows to start the year it’s important to take the whole preseason into account. Someone may emerge as a Round 1 smokey and start in an AFL team’s side only to be sent back to the two’s the following week. It’s tough to find the perfect mix of fantasy production and job security, but it’s important to take the time and make wise investments with your final bench picks – yes, even R3 & R4. I will be back with weekly updates on the rookie/cash cows, digging through the reserve levels to find hidden gems throughout the season. Enjoy these final peaceful nights without the stress of fluctuating fantasy scores, because for the next six months we are all competing against each other to win it all and end Selby’s streak at the top of the leaderboard. No Cavarra? He is only out for two weeks. Other then that great job Fry! How many port rookies is too many? Lockdown Key defender who will play 1 game for a 40 and then be omitted for Thomspon in round 2. Wondering how you have Atkins averaging 70? Scored 61 (69% TOG) in JLT1 and 46 (88% TOG) in JLT2 playing in a pressure small forward role going up as far as the 50m line. I would have thought he average more around 55. Setterfield didn’t play in 2018. Great article mate! Thoughts on Nick Blakey? currently have him but no mention. Supposedly had a great praccy outing but nothing since has been heard. As a Swans fan he isn’t guaranteed a gig in R1. Could come down to whether Buddy plays or not. Don’t think they will play Buddy, Reid as well as Blakey. Especially if Sinclair spends some time forward as well with Aliir possibly playing as a mobile ruck (especially against the Dogs). Even if he plays, I don’t think he will be a very high scorer at all. Could possibly even have some 20-30 games. I know he’s not quite a rookie but Lincoln Mccarthy? Looked good JLT and currently my f4. Thoughts on him? Love the write-up, Fry. One minor correction: Harry Jones played only JLT1, not 2. Only thing I disagree with is I’d swap Balta and Lukosius. I think they are just trying to keep the hype around Balta down. Well ahead of Soldo I reckon and personally don’t believe they’ll want to use Lynch in the ruck whatsoever. Brilliant work Fry, very thorough and informative. Glad to see I have the same thoughts on many of the rookies, makes me feel like I am on the right track. Look forward to your updates in the coming weeks. Cheers mate, I think the majority of the comp is across the rooks at the moment. The tough part will be selecting the right one when the teams are revealed. Ridley from Essendon? Playing a sweeping role and scored well and looked like he had a place in the back 6. Burgess’s JS is better, but Balta should score more. Now that Balta’s named in a side with Lynch his JS is probably not too bad, but is it good enough? Thanks Fry, brilliant as always from you, much appreciated! Thoughts on Ridley from Essendon?